Having worked with several hundred artists in my career, I learned something different from every single one of them. Yet, others had a lot more to offer, like in the case of Tito Puente, I was always in the presence of a wealth of knowledge. In my years at TropiJazz and during the Tito’s 100th recording, Tito and I had the chance to converse several times at concerts, promotion tours (my favorites being in Puerto Rico and New York radio stations) or just at the RMM offices for endless hours. I recall Tito always wanted to do a recording with famous A-List artists like Tony Bennet, Carlos Santana, Patti Labelle and others of such caliber. He wanted my support to convince Ralph Mercado to fund the astronomical project. When Joe Conzo and I were given the task of putting together a 50th anniversary compilation, Tito insisted not do a greatest hit package which had already been done by other labels time after time. He wanted to do the vocalist, the small band, and the orchestra. Guess what? That's exactly what we did...three-CD compilations dedicated to these respective formats. Getting permissions from the various labels was a task of its own, yet we did as best as we could. Speaking of acclaimed figures, Tito was no stranger to having celebrities around him all the time. International famous celebrities were regular attendees at his concerts like in the Village Gate and all the Jazz clubs. They loved to join in with Tito on stage playing clave beats, and cowbell stints. Of course, fans loved every bit of it. Tito was mentor, a scholar and an innovator; though I wish I would have had more time with Tito. My last conversation was when Tito was leaving for Puerto Rico in the middle of the recording "MasterPiece" (Obra Maestra), his first in conjunction with Eddie Palmieri. Tito wanted me to 'hold the fort' while he returned, he said. I remember like it was yesterday. After performing with the Philharmonic of Puerto Rico during weekend, Tito returned back ill and died during the heart operation. I will never be able to say goodbye to a good friend, though he lives deep in my heart as well as the hearts of millions aficionados. 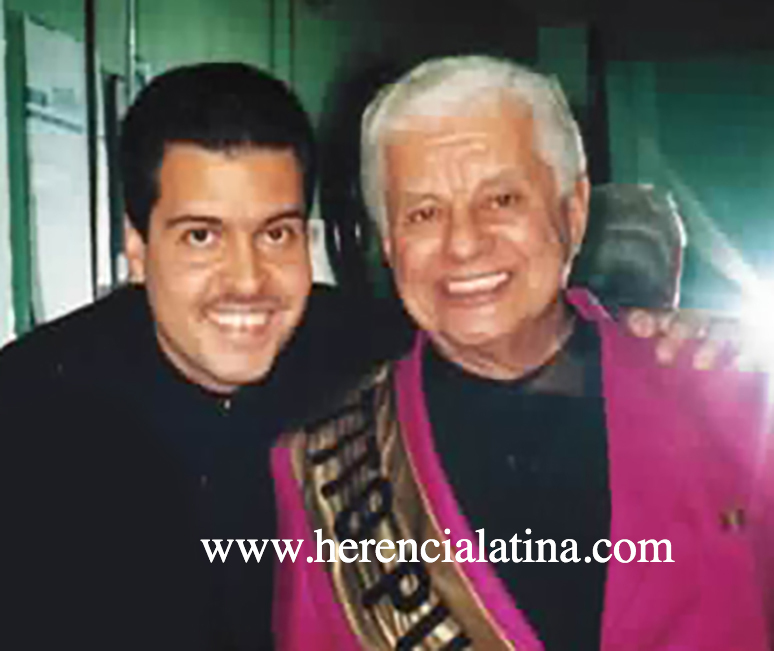 By the way, the Tito Puente 100th album was a project that began as a recording session to include the best of the best. Unfortunately, major record labels like SONY would not allow Gilberto Santa Rosa to record with RMM. They felt if a track from such innovation would rule the radio charts, then Gilberto's solo recording would suffer enormously. Many other record label companies believed the very same as SONY, and backed out of the deal. Another great artist was La Lupe whom got into religious music and convinced herself Salsa music belonged to the devil, backing out of the deal too; and other alike didn’t follow through. Yet many industry people, even nowadays, believe RMM did this recording to promote its vocalists. But that was not true...it simply was what we were left with at RMM at the end. As the year continues to roll at a steady rapid pace, we find that very much like the late 60’s and 70’s, there are hundreds of recordings surfacing from the USA, the Caribbean, Central & South America, and even more today from Europe than in those decades. And, just like that period, there are many bad recordings and misleading claims. Today you see albums that claim to be the ‘hottest’ or the ‘best’ or even the ‘best Salsa Dura,’ and turn out to be duds. Here, at Herencia Latina, the aim is to bring you the best of the best, being serviced to us… And that is a key factor: if artists do not send the releases, it is hard to review and make recommendations. Here are some CD’s that impressed us recently: percussionist Johnny Cruz, who just reissued his 2006 CD “Back To The Classics,” with his Dream Team Band that features guest vocalists Adalberto Santiago, Ray Sepúlveda, Frankie Vázquez, Ray Bayona & Cheo Medina, also released last year’s concept CD “Pays Tribute to The Chairman of The Board Adalberto Santiago.” Now everyone can enjoy this great CD, which besides the return of Bayona, Medina, Vázquez and Sepúlveda, includes the vocal talents of Herman Olivera, Yolanda Rivera, NG2, Nino Segarra, Bobby Cruz, and Javy Marrero, in what is one of the early favorites for the best of 2013. Another favorite comes from Connecticut in the form of Orquesta Espada! Their CD “On The Cutting Edge,” with vocalist Marco Ocasio, includes some awesome tracks, like “It’s On Me,” “Amor,” “Slow Jam,” “Procrastinator,” “Dulzura,” “First Love,” and the instrumental “Double Edge.” Let’s add Orquesta Espada to the ‘New Band of the Year’ nominations! The Spaniard band Tromboranga, led by percussionist Joaquín Arteaga, continues to score big, with the CD “Al Mal Tiempo Buena Salsa,” which is a title that reflects the times we are in -- lots of great music, during a time where we have a lack of media coverage like the one we had years ago. Today all promotions are done differently and we must relay on You Tube and the internet to promote the music. Tromboranga uses the trombone sound of the 70’s with today’s arrangements, and they shine on tracks like “El Mensajero,” “Soy Sonero,” “Repica Bien el Tambor,” “Alabanciosa,” “Mambo Salvaje,” and “Rompercolchón”. Johnny Ray Salsa Con Clase celebrates his 40th anniversary in the industry with the CD “40 Años De Cañonazos,” with 15 of the band’s best Spanish hits. Vampi Soul has released a fine compilation, “Salsa Bestial”, by Puerto Rico’s Orquesta El Macabeo, that includes selections from the albums “Salsa Macabra” and “El Entierro.” This unique band fuses Salsa with Punk, Rock, Ska and Reggae and has been an innovation on the island. Jazz pianist Yoel Díaz has been making a name for himself in Canada with his stylish Latin Jazz, that for me started with the 2010 release “Encuentro (B.B.Q. Con Son), but his 2005 “Te Llegó” quickly became my favorite, as it covers more of his Cuban roots of Cha-Fusion, Funky Latin, Timba, Cuban Jazz and more. Diaz’ latest, “Origen,” is his supreme experiment as a solo project that gives new twists to a host of older classic standards. We have been losing many great musicians, most recently Bebo Valdés, Edgardo Morales, Daniel Ponce and David Torres (ex-Poncho Sánchez pianist & member of Tierra), but along the way we lost some who are lesser known, like Noah Rodriguez, who in 1957 recorded and played bongos for Harry Belafonte on “Songs Of The Caribbean” LP. Those of you who remember Tumbao Bravo, from Detroit, Michigan, should now listen to conguero Dr. Alberto Nacif’s band Aguanko and their CD “Elemental,” with special guest José ‘Pepe’ Espinosa. This will be one of the year’s best Latin Jazz projects, with sure shot radio hits “La Bicicleta,” “Chiquita,” and “Chasin’ Chano,” all written by Dr. Nacif, who is an acclaimed doctor with his own practice by day! Venezuelan songstress Ariana Dao makes her debut with “La Diva De La Salsa,” with her Salsa Sensual that includes a few covers and has potential hit makers in “Culpable O Inocente,” “Hasta Que Me Olvides,” “Elenita,” “Corazón De Niño, Corazón De Hombre,” “Te Voy Amar,” and “No Tengo Nada (I Have Nothing),” a huge hit for Whitney Houston done in Spanish. Vocalist Ricky Luis was just in Los Angeles recently to promote his 2012 debut “Out The Box,” which he had been working on for the past two years, after he left the band N’Klabe. While the opening track, “La Clave,” reminds you of the sound he had with the group, it is the song “Con Ella- Superwoman” that has commercial radio hit written all over it. La Guatequera comes to us from New York and is led by composer Carlos Aragón, which hits big with the first single, “El Calvo Paluzzi,” followed by “La Sucursal Del Callao.” The showcase of the band is their vocalists. One of the greatest things about live recordings is that they become pieces of history, especially when they document a particular time period for a Hall Of fame act. Irakere celebrates its 40th Anniversary with the release “Live at Ronnie Scott’s, Birmingham: The BBC Recording,” recorded in 1995, and broadcasted live on BBC Radio 3. The band still had Mayra Caridad Valdés, César López, Juan Munguia, Adalberto Lara, Leo Vera, Carlos Manuel Carlos Del Puerto and Enrique Pla in its formation.